41D was a calf that we showcased in 2016. His mother, a direct Trust 100W daughter, was likely our strongest first calver, and was an easy favorite of everyone who visited the farm that year. She has a beautiful udder, with perfect teat size and placement, and she is a very promising cow in our Hereford herd. This calf had 'the look' right from day one. He held incredible balance and eye appeal throughout the summer and into the fall, and was admired by many people both within and outside the Hereford breed. A great asset to him was also his low birthweight, and his consistent sire, Torant 440T, who had been a game changer for us in the 8 years he walked at Redline. 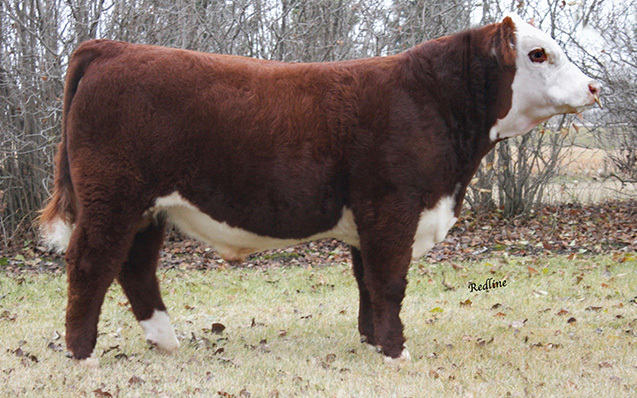 Crimson Tide was sold in the Season Finale Hereford Event to Half Diamond Hoar Farms in 2016.